Kevin Tomson- Hooper shows some of the many art pieces at the Artisans Village Art Gallery, opening Friday. 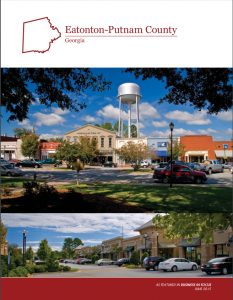 If you’re really into aesthetics and enjoy finished works of art as well as viewing its creation – or maybe just an old school Georgia Bulldogs fan – Eatonton is a great place to be this weekend. In addition to an unveiling, a grand opening and an interesting en plein air event, Georgia coaching legend Vince Dooley will be in town giving a Civil War history lesson. “Most people associate Vince Dooley with being the long-time football coach at the University of Georgia, and they are surprised to find out he not only is an accredited historian, but also an accomplished gardener,” said Paula Benjamin of the Georgia Writer’s Museum. The Eatonton-based Georgia Writer’s Museum will host Dooley on Sunday at the Cotton Warehouse. The weekend-long cultural event kicks off at the Georgia Writer’s Museum on Friday with the mural unveiling ceremony set for 3:30 p.m.
A stupendous mural designed by Greensboro artist Gail Vail and painted by Putnam County High School and Georgia College students depicting famous authors Flannery O’Connor, Joel Chandler Harris and Alice Walker will be unveiled. “This mural has been a collaborative project involving the community,” said Kevin Tomson- Hooper, the president of the board of directors of the Artisans Village. The mural unveiling will take place on the side of the Georgia Writer’s Museum facing the Farmers Bank parking lot. Friday evening from 5-8 p.m., there will be the grand opening and ribbon cutting of the Artisans Village Art Gallery on Marion Street across from the Putnam County Courthouse. “The gallery is just phase one of our multi-phased plan for Eatonton. We’re about 18 months away from opening the actual Artisans Village, and this is a great way to host the commissioned sale of works from around 20 or so area artists,” said Tomson-Hooper. On Saturday, the heyday of French Impressionist painters like Monet, Pissarro and Renior will be replicated with the Plein Air Event. According to Linda Foster of the Briar Patch Arts Council, there will 15-20 top painters from Atlanta, Athens, Conyers and Milledgeville descending upon Eatonton for the outdoor painting contest. The artists will be given a 16×16 blank canvas and told to stay within a mile radius. Local people will be afforded the opportunity to see the artists work in open air, as opposed to inside a studio, at various venues around town from 10 a.m. until 4 p.m.
“The artists will then all get back together for the judging of the contest,” said Foster. The cultural awareness weekend will conclude Sunday with Dooley at the Cotton Warehouse 2-4 p.m.
“This is the true story of a UGA grad who went off to The Civil War,” said Benjamin. Dooley will be signing copies of his new book, as well as previous publications. A cash bar and light hors d’oeurves will be available. Limited tickets are available for $25 from the Georgia Writer’s Museum at www. georgiawritersmuseum.com .